The F1 circus arrived in Canada with McLaren having won five victories to Ferrari's single win, although Ferrari was beginning to edge a little closer thanks to a controversial new engine-mapping arrangement which the FIA agreed was legal. This system enables the engineers to change the engines' characteristics to give the best possible performance for each circuit and each driver. The two McLarens were ahead in qualifying but it was David Coulthard rather than Mika Hakkinen who took pole position. Michael Schumacher was third. On race day Coulthard made the best start but Hakkinen was slow away and fell behind Schumacher's Ferrari. Further back Ralf Schumacher failed to get off the line in his Jordan and this caused congestion in the midfield. The result was a spectacular accident with Alexander Wurz's Benetton trying a rather silly move on Jean Alesi's Sauber at the first corner. 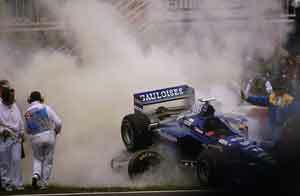 The Benetton was launched into a roll and both Jarno Trulli (Prost) and Johnny Herbert (Sauber) were taken off. The race was red-flagged and the cars sent back to the grid for a restart. There would be more chaos at the second start with Hakkinen suddenly slowing at the first corner and Ralf Schumacher spinning in avoidance. This caused Trulli and Alesi to collide (again). Eddie Irvine (Ferrari) and Wurz also collided and both had to pit at the end of the first lap while the race came under the control of a Safety Car. After five laps the race was on again with Coulthard able to keep Schumacher at bay. Fisichella followed, ahead of Rubens Barrichello's Stewart. Soon afterwards Pedro Diniz went off in his Arrows and spread turf all over the circuit and the Safety Car was again needed. When the race restarted Coulthard suddenly slowed with a throttle linkage problem and at the same moment Mika Salo crashed his Arrows heavily and another Safety Car was ordered. Michael Schumacher took advantage of this to come into the pits but when he rejoined he drove Heinz-Harald Frentzen off the road. This resulted in a 10-sec stop-go penalty for the Ferrari driver. Fisichella was leading with Villeneuve behind him but at the restart Villeneuve took the lead and then went into a sandtrap and dropped back. He then crashed into Esteban Tuero's Minardi. After Schumacher had completed his penalty he was third behind Damon Hill's Jordan. He overtook Damon and chased after Fisichella. During the final pits stops he was able to get out ahead to win, Fisichella coming second. Irvine survived to finish third with Wurz fourth and Barrichello fifth. Jan Magnussen finished sixth for Stewart. A few days later he was dropped by the team in favor of Jos Verstappen.